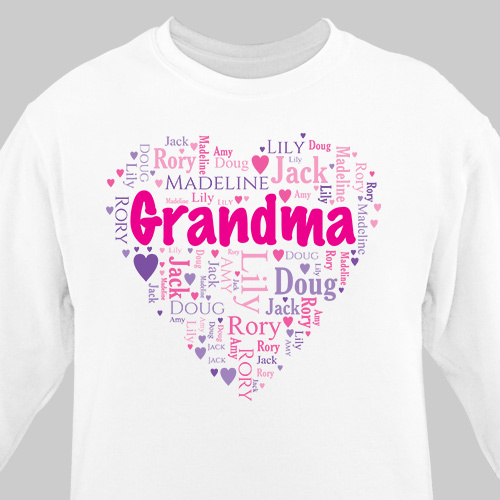 Show Grandma how much her family loves her by giving her a personalized Grandma sweatshirt this Mother's Day! Each one of her loving family members will be featured in a loving heart design created using our word art tool. Grandma's Heart Word-Art sweatshirt is on a premium white cotton/poly blend Personalized Sweatshirt, machine washable in adult sizes S-3XL. Available in White, Pink and Ash Gray. Word-Art Text area: We recommend placing all of your children or grandchildren's names in the Names area. Text in this area is limited to 20 character/spaces each. We recommend using 10 or fewer words for best presentation. I absolutely love it. It is now my favorite sweat shirt.